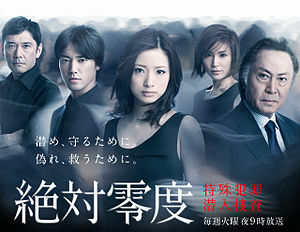 Cast: Ueto Aya, Kiritani Kenta, Yamaguchi Sayaka, Maruyama Tomomi and Kitagawa Hiromi. This drama is a lot like the typical Japanese police dramas, and yet not; it’s a lot more action-packed and pretty nerve-wracking. Now, I’ve watched a lot of police dramas, mainly with the CSI and Cold Cases (like the first season of Zettai Reido), but this is my first time to watch something about undercover agents (and that also covers all the American series I’ve watched). And to be honest, I was shocked! Didn’t know that all those things they do are legal.. lol.. The lead characters make a superb team; I wish they had given them some more screentime together; it’s very limited in my opinion.